Could Bond Yields Continue to Rise post the 7-year high? Although 10-year US Treasury (UST) bond yields briefly breached 3% in September – a level not seen since May, when it touched a seven-year high – Citi believes long-dated UST yields could remain contained by trade wars, emerging market (EM) volatility and relatively slower non-US growth despite strong US fundamentals and rising inflation. Citi's Q4 target for 10-year UST yields is 2.75%. US investment grade (IG) corporate bonds: Yield levels at seven-year highs have created an attractive opportunity for investors, particularly at the short-end. In September, the yield difference between short- and long-term IG reached its flattest level since 2009. Citi analysts are overweight on US IG corporate bonds and favor energy as well as financial sectors. US high yield (HY) bonds: Fundamentals are still strong and relative value exists compared to other markets. 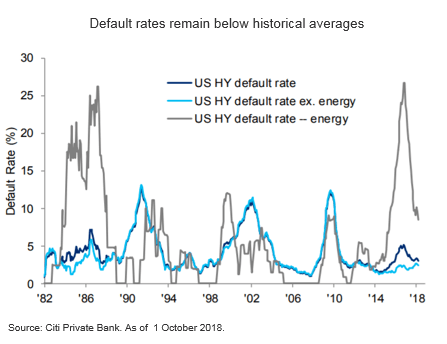 Default rates at 2.8% also remain below historical averages and could fall further. Lower defaults should also contain spreads and keep borrowing costs low. Citi analysts favor US bank loans – which benefit from rising short-term rates and lower volatility – and lower quality HY bonds over high quality HY bonds.